No, it isn’t Atlantis. 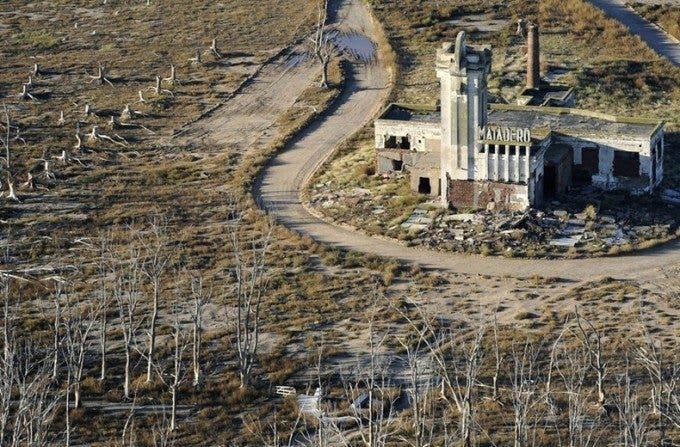 However, a town in Argentina spent 27 years submerged by the sea and the waters have now moved on to reveal lots of ruins. The town used to be the home to over 1,000 people and gained lots of tourists because of the saltwater lake right by it–which was similar to the Dead Sea. It had a bustling railroad and was a major trading center that started to come up during the 1920s. There were loads of businesses and apparently the tourism industry brought in 25,000 people a year. In 1985 though, the sea flooded after lots of wet winters and a major rainfall. The waters have now rescinded, and the town can once again be explored. If any scene looked apocalyptic, it would be this town. There are loads more photos over at the BBC and on Google Images.